Ms Zurabishvili "was at first very sceptical"
A French diplomat is about to start a new life - as foreign minister for the former Soviet republic of Georgia. 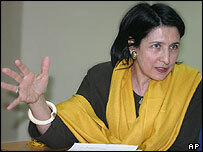 Salome Zurabishvili, 51, was born in France to Georgian parents, but won a posting back to Georgia as the French ambassador. She will now be granted Georgian citizenship in addition to her French passport. Georgian President Mikhail Saakashvili said it had been "his dream" to appoint to the post since he met her in 1996. "She made a brilliant career in France but she stayed a Georgian at heart and a true patriot," he told reporters. Mr Saakashvili said he believed such an appointment was "unprecedented in the history of diplomacy". He said he had cleared the move with French President Jacques Chirac during a visit to Paris. "It is a very important gesture on the part of the French government, a very significant gesture on the part of the French president. "She is a senior employee of their diplomatic service. "They know and trust her personally." Ms Zurabishvili, whose family emigrated to France early in the 20th century, has worked as a French diplomat in the US, the European Union and Nato. She also headed the international department of France's national security general secretariat, before her appointment to Tbilisi last year. Mr Saakashvili, a US-educated lawyer himself, has appointed a cabinet with many Western-educated ministers since he was elected in January.